GoldenEar’s founders and their engineering team have literally hundreds of years of combined experience and have created or helped to create many of the world’s best-sounding and best-selling loudspeakers. They have joined together again to build their finest speakers ever. The GoldenEar team fully utilizes all its combined experience to deliver more sonic superiority, with performance that is often unequalled in competitors’ speakers selling for three, four or five times as much as a comparable GoldenEar speaker. Most importantly, the signature GoldenEar sound is consistent through all of their loudspeakers, regardless of price, because GoldenEar cares enough to set the same sonic goals for every loudspeaker they create, from least or most expensive. The Triton One is an evolutionary speaker that builds upon all the advanced technologies that have made the Tritons famous. The sleek 54″ tall Triton One represents the highest technology GoldenEar has to offer, including 56 bit DSP engine for the sub section, a fully balanced crossover design, high-end film capacitors, advanced cabinet design, and much more. 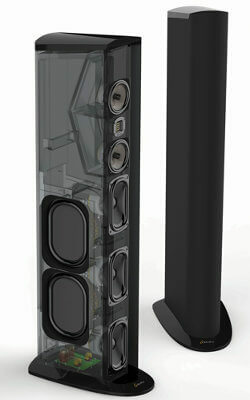 The Triton One includes a built-in subwoofer section powered by a 1600 watt GoldenEar ForceField digital amplifier. The amp drives three 5″ x 9″ front-mounted quadratic subwoofer bass drivers which are coupled to dual (per side) side-mounted 7″ x 10″ quadratic planar infrasonic bass radiators. Our newly developed Frequency Dependent Bass Loading Technology, utilizing open-cell polyurethane foam damping pads, as well as special hollow-fiberfill, further optimizes low-frequency performance.There are two newly designed 5-1/4″ cast-basket midrange/upper bass drivers, which incorporate GoldenEar’s proprietary Multi-Vaned Phase Plug (MVPP™) design, housed in dual discreet midrange chambers, arranged in a D’Appolito array surrounding the extraordinary GoldenEar High-Velocity Folded Ribbon (HVFR™) tweeter.